Titan Comics: Doctor Who - THE NINTH DOCTOR #5 Review | Warped Factor - Words in the Key of Geek. 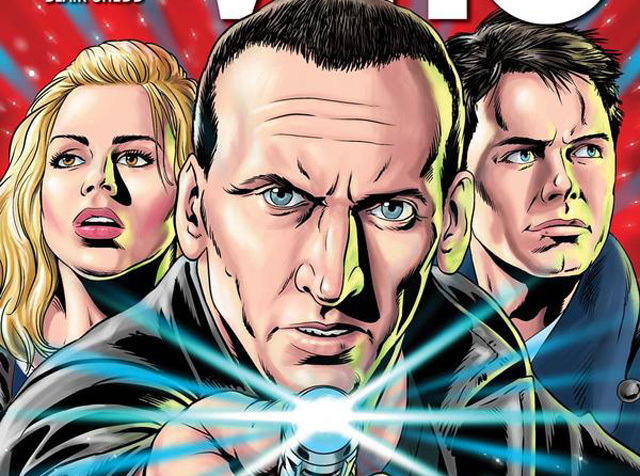 Tony Fyler reviews the concluding issue of the Ninth Doctor miniseries from Titan Comics. It’s a message that’s been of particular relevance in Doctor Who over the last ten years. The Doctor, our Doctor, was always above and slightly out of our reach in the Classic years, but since the dawn of the Ninth Doctor in 2005, he’s been haunted, damaged by the Time War and his part in it. It’s a lesson that resonates throughout issue #5 of the Ninth Doctor comic-book by Cavan Scott. In a way, this issue is symbolic of the fundamental change in tone between Classic and New Who, and it certainly captures the flavour of the modern era as it began with the Ninth Doctor – the Time Lord as superbeing, yes, but just as flawed, just as questioning, just as dangerous as any of the rest of us. The Time Lord in need of humanity, in need of healing from his disdain, from his propensity simply to feel disgust and lecture the universe on its hopelessness. A Time Lord in need of Rose Tyler. The storyline of Weapons of Past Destruction, this first five-issue story with Big Ears, Noddy and Captain Innuendo has actually been fairly simple. It’s a war, a post-Time War conflict between two alien species, the Unon, who sound like noodles but who look like silver centaurs, and the Lect, who look like Humpty Dumpty’s armour-clad uncles, but sound like the kind of domestic robot you’ll be able to get in Wal-Mart fifty years from now. After listening to the nobility of the Unon’s mission to protect time from harm, and even undertaking an assignment for them, the Doctor seems to have chosen a side. But all is clearly not what it appears. This issue sees the Doctor unceremoniously ‘rescued’ by Rose and a Lect, and the truth behind the war that’s been tearing these civilisations to shreds emerges. The Unon, with their time-protecting helmets on, are trying to fill the void left by the Time Lords. Cos that always goes well. Without spoiling the story for you, there’s a healthy chunk of flashbacking here through a handy psychic interface (Rul1 1 of fantasy storytelling, if in need of a flashback, invest in a good psychic interface), and Scott shows us exactly how focused and insular the Ninth Doctor was before he met the blonde-haired Earth girl. It’s a fact that often passes us by because of who we know the Doctor to have been in his previous lives, but it’s worth remembering that when the Ninth Doctor met Rose Tyler he was ‘just passing through’ – and his immediate answer to a department store full of Autons was to blow it to smithereens. We only join him as the difficult process of his healing from his life as the War Doctor (or at the time, from his time as the Doctor that fought in the Time War) was about to begin, but Scott gives us a gracenote of his grandiose blinkers here – this stupid little war is not really his problem, and he seems content to let it play out however it will. But Rose won’t let him. She finds, in her belief in him as a man who makes a difference, some spark of the quintessential Doctor in him here, and he turns things on their head at the last moment. Which is not to underestimate the role played by Captain Jack in this issue. Rose might bring the Doctor to his senses, but it’s left to Captain Jack to bring the Unon to theirs, and the way he manages it is equally telling of his hero worship of the Doctor as a man who makes the universe better simply by travelling through it. 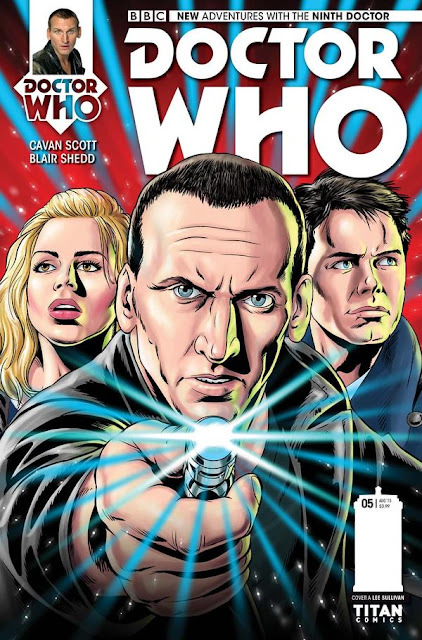 In story terms, Scott delivers a well-rounded final instalment to his tale of an early Ninth Doctor, still not entirely sure of who he is in the universe, and aided in his process of self-rediscovery by the Earth girl and the con man. You can close the covers on this one with a satisfied sigh, and eagerly hope for more from the Ninth Doctor and Titan soon. But the story is only half the story here, if even that. The artwork – oh, the artwork. There’s a dreamy, trippy watercolour feel to Blair Shedd and Rachael Stott’s work here that fits perfectly with the kind of storytelling and scenarios involved. Especially when delivering the psychic flashback, it’s artwork that actively aids the storytelling by washing out the colour, making everything feel like an illusion around our characters. Anang Setyawan, the colourist on this issue deserves high praise not only for helping create effects like that, but also, for instance, for delivering dizzying scope and scale– there are long sequences here with Jack, in a white T-shirt, suspended in a white void, being questioned by the shiny white Unon. It’s almost ridiculously difficult to get that right, to draw and subtly colour it so that it delivers a sense of scale, rather than simply being bland on bland. Shedd, Stott and Setyawan do exactly that though – and there’s a panel where Jack is left alone that might actually make your stomach lurch, as it gives the two-dimensional equivalent of a rapid focus-pull, to show how tiny he is in the massive void of his imprisonment. Apart from these moments, there’s more standard comic-book excitement too – some great architecture work in the Unon city, for instance, some solid species work in showing us what’s inside the egg-like armour of the Lect, and only a few, well-chosen silhouette panels this time, which is a relief, as in previous issues, that initially innovative technique had begun to rather wear out its welcome. Bottom line, I’m not going to try and make you buy issue #5 of Weapons on Past Destruction. If you’ve bought the other four, and you’re any kind of obsessive, which is to say any kind of fan, you’re going to buy it, even if I tell you it’s utterly nonsensical dreadfulness, rendered in stick figures. It isn’t, of course – Cavan Scott cares about his Who far too much to let that happen, and in the artwork here, you get far, far more than your money’s worth in terms of skill and intelligent decision-making, so the artwork and the colour choices are active parts in the delivery of an effective story, just as lighting and effects are in the on-screen version.